Black tourmaline is the most protective stone that you can have. It differs from other protecting stones because it does not take negative energy and throw it off, but actually absorbs and transforms the integrity of the energy. Any negative energy that comes into contact with black tourmaline is automatically dispelled and replaced with positive vibrations. As early as 1880, it was discovered that black tourmaline had a constant electric charge. In fact, in Asia, black tourmaline is still referred to as “the electric stone”. It is no wonder that this stone is able to work against all negative energies, such as people, places and electronics. Obsessive compulsive disorder (OCD) is a growing physical ailment among many. There have been no scientific breakthroughs as to how or why this condition exists. Black tourmaline has been known to calm the body’s electrical impulses that allow obsessions to subside. When placed in your bedroom, your mind is able to throw off stress and be at peace in order to get rest. It will also strengthen the immune system and assist in pain relief of arthritis, and the relief of spinal or muscular problems. Staying grounded and protected from negative energy are the two most common problems to conquer when keeping the chakras in balance. 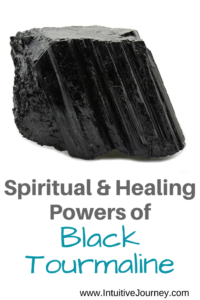 Black tourmaline’s powerful presence takes control of both of these areas so that you can continue your journey to a higher spiritual dimension. 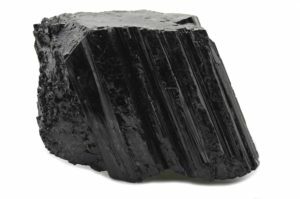 Genuine black tourmaline is not a single mineral but a mixture of many. They may include Elbaite, Schorl, Dravite, Uvite, Liddicoatite or Buergerite. The chemical composition is Sodium Iron Aluminum Boro-silicate Hydroxide. Be leary of those dealers that present a jet black, highly-polished stone. Many are made in labs and are lacking the power of the real thing. You may encounter some black tourmaline that is not black at all, but multi-colored. Always buy from a trusted supplier in order to receive the highest power possible from this remarkable stone. If you are interested in purchasing black tourmaline, you can find some here. If you enjoyed this post, I’d love for you to “PIN IT”!